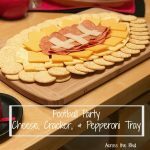 As we’re getting ready for football season, I’m thinking of ideas for throwing a fun party with lots of fabulous game day food. 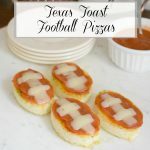 These Texas Toast Football Pizzas are easy to make and guests will love them. The shapes can be cut ahead of time, saving you time on game day. To make these into the shape of a football, I tried to find a football cookie cutter. I didn’t have any luck, so I improvised. I used a metal egg cookie cutter and bent it slightly to form a more oval shape like a football. I pressed it down into a slice of Texas Toast and cut away the excess on the outside. Putting this together is just as simple as you’d imagine. Place the toast on baking sheet, bake for 4 minutes, remove from oven, add sauce, pepperonis, and place strips of cheese on top. Return to over for 2 minutes. If you’d like to add more toppings, I would place them between the sauce and the pepperonis. Make these easy appetizers for a game day party. 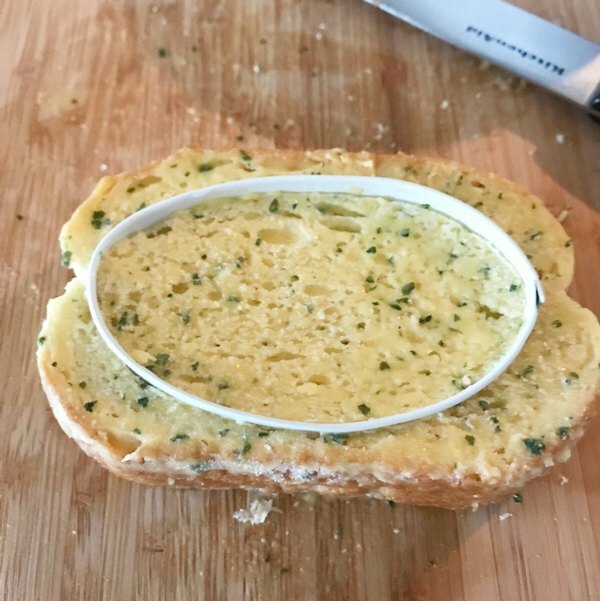 Start with Texas Toast, add toppings, and use cheese cut into strips for the football laces. 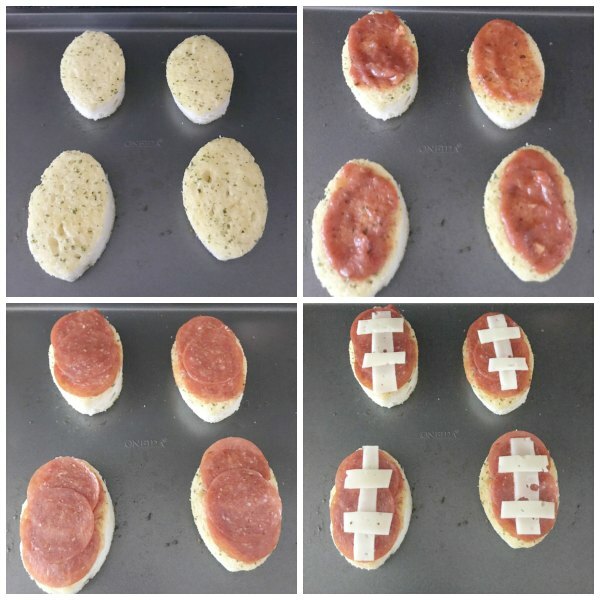 Use a cookie cutter to cut a slice of frozen Texas toast into the shape of a football. Place football shaped Texas toast on baking pan. Bake for 4 minutes. Remove from oven. 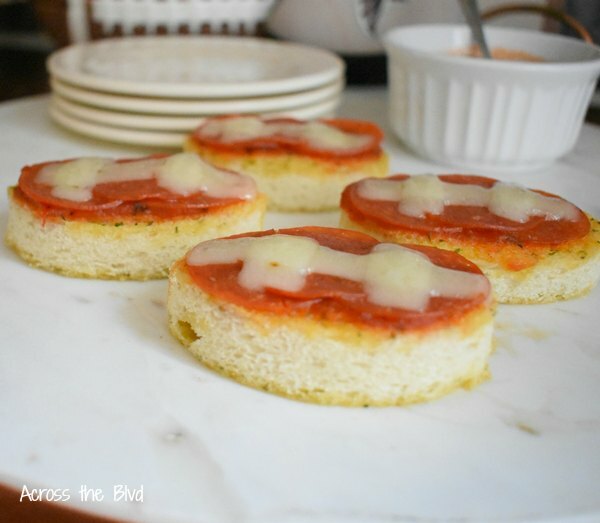 Top each slice with 1 tablespoon pizza sauce. Top with 3 slices of pepperoni. Cut a slice of white cheese into three strips per slice of Texas toast. Add to the top to mimic football laces. Return to oven for 2 minutes. These turned out great! Having a side of pizza sauce for dipping added to the flavor. *Tip Bake the edges that were cut away from the football shape at 425 degrees for 5 to 6 minutes or until brown. Cut them into squares to use as croutons. Store them in an air tight container. If you want to make a lot of these for a party, I would recommend cutting the shapes ahead of time. Place them in an air tight container or freezer bag and keep frozen until you’re ready to add the toppings and bake. That will be a time saver for the day of your party. 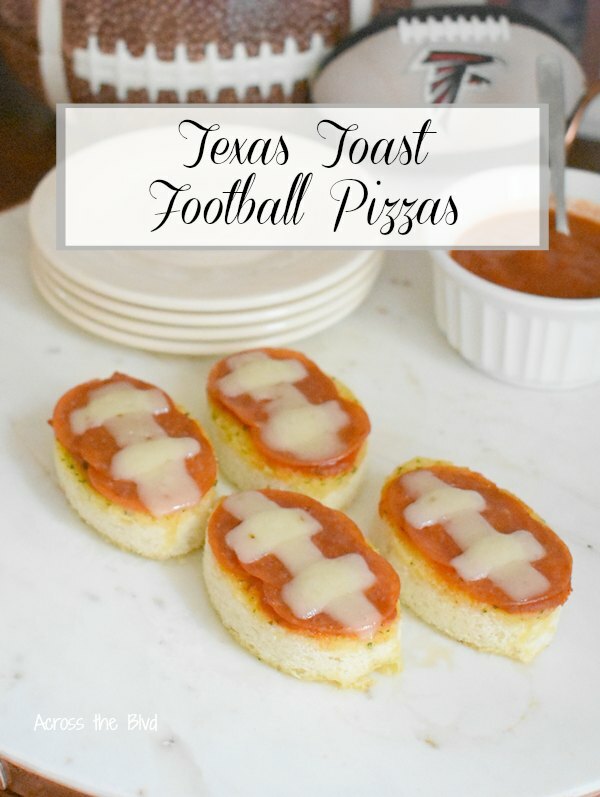 Even if you’re not a football fan, these Texas Toast Football Pizzas are sure to be enjoyed! 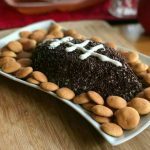 Are you looking forward to football season and game day foods? 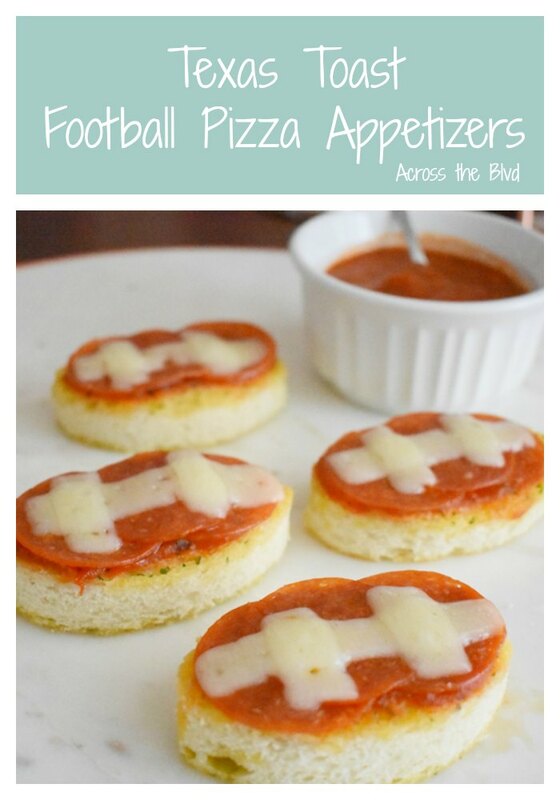 You might also enjoy these appetizers that are great for game day! I think I might eat Way too many of these!! Just yum! Thanks for sharing at the What’s for Dinner party – have a fabulous week! It’s easy to eat a few before you know it. Thanks, Helen and thanks for the party. So cute and perfect for the upcoming football season! Thanks, Amy. 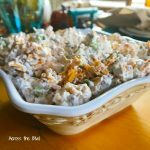 They are great appetizers for a football party. These are TOO cute! My hubby would love these for football-watching days. So clever to use the edges for croutons. Thanks so much for sharing with us at the Whimsical Wednesdays Link Party! They are great for game day snacks. 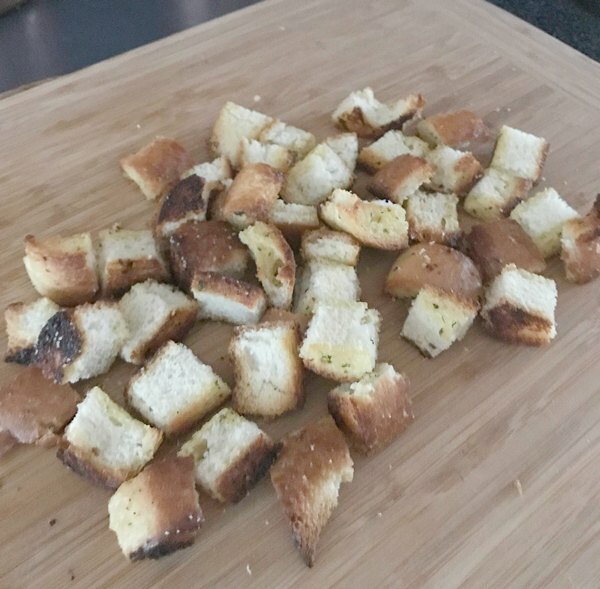 I couldn’t waste all of that extra, so turning them into croutons was a tasty way to use it up. Thanks, Michele!